Maine Camp Experience (MCE) camps are lauded for their far-reaching traditions – and in fact, many MCE camps have been continuously operated for over 100 years. One aspect of this incredible longevity is the amazing history that MCE camps have contributed to over the years. Camps create an environment that feels like it is of another era – and this sense of history is augmented by the actual history our camps contributed to. It really is amazing to gauge the way certain things have changed over the years, and to appreciate the ways MCE camps contributed to history in bygone eras. While arriving at an MCE camp might feel like stepping into an environment of well preserved traditions with some modernization through the years , the process of getting there has changed quite a bit since the early 1900’s. When many MCE camps were first founded, there were no chartered buses or flights to bring campers to camp – and most families did not drive to drop their children off. 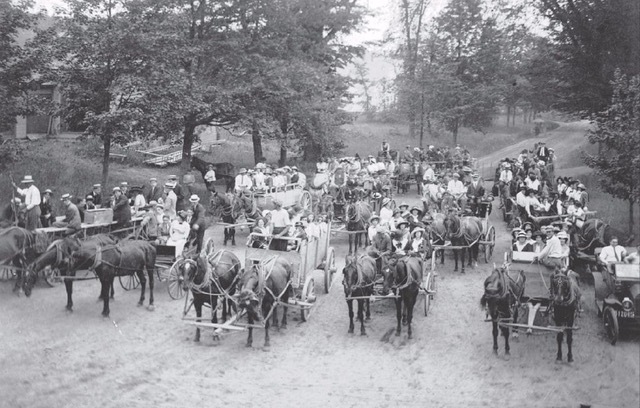 Instead, taking the train to camp, or even a horse and buggy, was a common occurrence – campers would frequently get on special train cars marked by flags, and would take these up to Maine where they transfer to a smaller regional train or met a camp truck. In fact, at the MCE camp I work at we still sing a song called “The Dinky Line,” about the train that took campers from camp to Bridgton, where they could then transfer to a larger train. This trip was certainly more time consuming than what we’re used to – in the song the camper leaves camp at “half past one” and reaches the Bridgton Junction “at the setting of the sun”; a journey that today would take about 20 minutes by car! And of course, traveling with a full summer’s worth of gear couldn’t have been easy (especially in an era before Camp Trucking), but campers would wrangle their gear together in hard trunks and make the trip – a summer at camp is certainly worth a little hassle! The extended history of many MCE camps also means that they existed during some of the most trying times our country faced – such as the two World Wars. And while the post-war eras resulted in one of the biggest camping booms in history, the period during the Great Wars were trying on the whole country, and camp was no exception. For example, during World War II, campers would actually bring up sugar and butter rations which would be collected by the kitchens and used to make the camp food. One of my favorite pieces of camp history also revolves around World War II – at the camp I work at, campers during World War II actually supplemented the jobs that would usually be done by men who were now off fighting. Older campers would climb Mt. Pleasant each evening, where they would stand guard at the fire station and alert the local towns in the event that a forest fire broke out – a job that, up until this time, had only been done by men. One aspect that really does set MCE camps apart is the history of camping in Maine that MCE families are a part of. But when really examining this history, it really is awe inspiring to think of the ways camps have contributed to history, and the ways that they have evolved with the times while preserving this sense of tradition. It really is remarkable to see how MCE camps have thrived throughout the years, and how they have carried this history from generation to generation.